Public urination doesn’t faze you, whether it’s a runner or a guy in a suit. You can always spot an elite runner in your regular loop. And a newyorker never stares. You go into a dark Central Park at 11 pm or 5 am, and don’t think twice about it. Un-showered post-race brunch is mandatory. You scream/curse at any one who crosses in front of you/is using the wrong path/walking or running more than two abreast, or even looks at you for more than three seconds. You run out-out-towners through Cat Hill or the Harlem Hills to impress them. You run into 500 people in your regular loop and know most of them, from work, your team, the races, tv, or the papers. You are used to seeing people talk on their bluetooth while running, and/or iphone in hand. You might pause your run to see what the polar bears in the Central Park zoo are doing. You have some of the most amazing races in your backyard and you either can’t resist doing all of them or are totally jaded and don’t participate in any of them. You live at a 3 block distance from five runnings stores and have to shop in all of them for different things. You spend the whole day on your feet, running shoes or dressy shoes. There are a billion running teams but you still think running has to be THE thing where you get to be alone. Headphones on! You would never even dream of winning/placing in your AG; this little island has way too deep a field in every race!. You always bring your metrocard with you on your run, because you never know where life the run is going to take you. In any given run/race you’ll see the ex-governor, Al Broker, Rafael Nadal, Mr G, Ilsa Paulson, Ryan Reynolds, or Prince Harry, and not look twice. You are used to signing up for races four months before, or they’ll be full by the time you come around to making a decision. 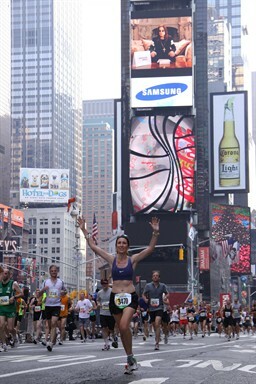 The only way anyone will see you in Times Square (oh, the horror) is during the NYC Half Marathon. ← sTANd to Run 5K Next Thursday! Dashing Whippets Track Meet in 3 weeks! LOL that’s funny! I live in Jersey, but I can appreciate some of these! The only times I go to Times Square are if I’m taking someone to the theater or if visitors from out of town demand to go there. I am sure you can, you’re close enough! Outstanding site! I mean that too. I have signed up as a follower. Running has been zero for me since August of last year. I ran yesterday for the first time. Overweight by 28 pounds and wayyyy out of shape. Hopefully the Loop can help me back up on the horse! Thanks for following, I post here now but check posts and visit there! I am sure we can help get you back on track if you need our push!! pls keep me posted ok!?!? I have not ran since last August and I am overweight by 28 pounds; plus wayy out of shape. Hopefully the Loop will help keep me on task. Hola! Te leo desde Buenos Aires (para que no creas que no tenés lectores por acá). Te leí durante semanas en RW antes de darme cuenta que eras argentina, lo que terminó de consolidar mi amor por tu blog. Estuve en NY el año pasado y aproveché para correr un poco por el parque y el costado del río. Me encanta BA para correr -mucho-, pero NY… amor amor amor. Espero poder volver pronto. Mientras tanto, leo tu blog. Awwww, gracias Rosaura!!!!! Me encanto tu mensaje! GRACIAS!. Bueno, cuando vuelvas me avisas y te llevo de paseo, y cuando vaya para alla me llevas vos, dale?! Gracias de nuevo! Dale, me copa. Pero vamos a comer porque no estoy ni cerca de poder correr tus tiempos y distancias! Absolutely true! I run pretty decent paces (8:00 for the half and 9:00 for the marathon so far) and am a Dashing Whippet and I’m basically the slowest person on the team! Field is so deep its crazy! What are you talking about!?!? You’re not the slowest anywhere! But yes, it’s crazy in the races… 😉 Small Fish, Big Pond! Haha I know, not REALLY the slowest. I came out for a 20 miler and ended up doing like 10 miles at half marathon pace and then chillin’ like a villain for 10 on my own. It’s inspiring though – pretty sure this running community is why I cut 22 minutes off my half marathon time in a year. It definitely helps a lot! Not offended at all! Love the mountains too! Love these. Can relate to most. Loving your new digs. I haven’t been around last couple of weeks to comment but I am back!! miss you!! miss you too, can’t wait to see you! I can’t imagine what the running scene is like in NYC. I appreciate being able to see some of it through your eyes! I have to agree with this entire post! Wait… you see Ryan Reynolds??!! Well, that would put my heart rate through the roof. Not all the time, but yes, I have.. he was also at Burger King 3 blocks from my apartment last week, yummy. Pingback: Recorrido » Concurso Cultural!! !